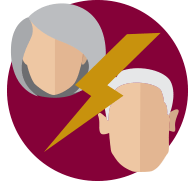 A gray divorce is a colloquialism for anyone going through a divorce over the age of 50. And why do couples getting a divorce in this age range get a special name for their divorce? Because after a long-term marriage, the divorce process can be very difficult and complex. Although the average divorce rate has gone down, the average divorce rate for this age group, in particular, has continued to increase. There are several contributing factors to this such as the fact that this might not be their first marriage, they are not empty nesters, they postponed their divorce until their children were grown or for financial reasons. When a couple in this age range gets a divorce there are several things to take into consideration including but not limited to retirement, social security, income, spousal support, insurance, adult children, long-term care, competency, and estate planning. This is why hiring a divorce attorney who has experience in gray divorce can be to your benefit to ensure that you have everything you need to live out the rest of your life comfortably. For example, let’s examine retirement. Retirement assets that were accrued during the marriage might be separated at the time of divorce. This amount of money will not nearly be enough for either member of the couple to live the same quality of life that they were used to having. Or, once separated you might not have enough income to help pay your bills so you dip into your retirement fund as a way to supplement the loss of income. Either way, this can be very dangerous and cause long term financial issues. A divorce lawyer who also has an estate planning background will be able to help you in your divorce as well as ensure that your future is planned so you can finally move on with your life.